Cleveland Easley works to uproot a weed at a pocket park on 19th Street and Meinecke Avenue under the hot, midday sun. He gathers the leaves in his hands and pulls; they break. Easley comes back with a shovel to get the rest. “I like getting the job done — I like doing it right,” he said. Easley is one of 200 youth being employed through the Clean Summer Youth Program, an expansion of the Earn & Learn summer work program. 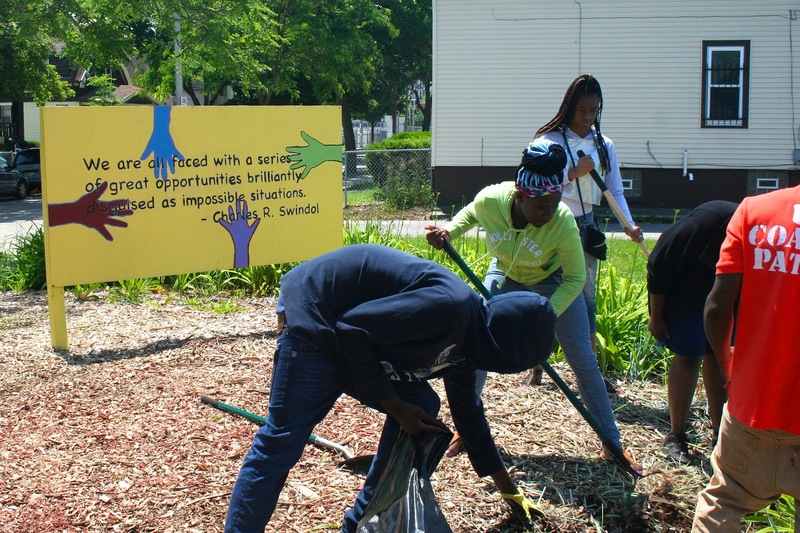 The new program is putting youth across the city to work for six weeks with the goal of cleaning up Milwaukee communities and reducing crime. Program participants were selected from a wait list for the Earn & Learn program, which has operated since 2005 and served more than 3,000 youth last year. “The way you reduce crime is you employ people,” said Stamper, adding that another goal was to strengthen relationships with city churches. Grace Fellowship Church of Milwaukee, Neighborhood House of Milwaukee, Running Rebels, Journey House and the Urban Ecology Center are all participating in the new initiative. Neu-Life Community Development, which operates the park at 19th and Meinecke, has employed youth through the Earn & Learn program for seven or eight years, said Director Jody Rhodes. Neu-Life was planning to get about 20 youth but learned in late May that about 10 more would be coming through the Clean Summer program. Jaquawn Seals is a full-time employee at Neu-Life who supervises a group of about a dozen students working at the pocket park. 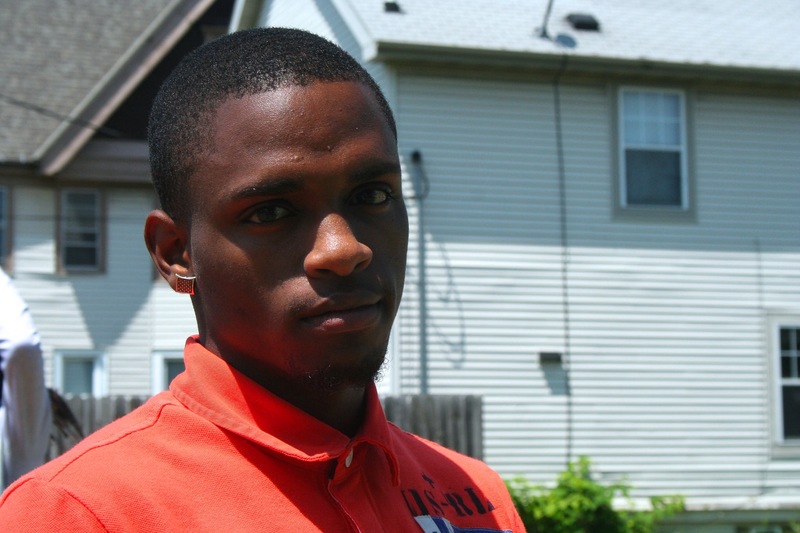 Seals, 21, who went to jail as a teenager for riding in a stolen car, described himself as “a troubled kid.” Then, when he was 15, Seals got a call from someone at the Milwaukee Area Workforce Investment Board (MAWIB), which runs the Earn & Learn program. He’s been working with Neu-Life ever since. Kahala Burks, 16, who has three younger sisters, has enjoyed the opportunity to play with young children at Neu-Life’s Wellness Wednesdays, an aspect of the summer program that brings different age groups together. Burks said it feels good to have a hand in changing her environment. The Clean Summer program also provides youth with “career enrichment” activities every Friday, including financial literacy education at Junior Achievement, a trip to Discovery World and more. Kendric McMillian, 16, is expecting a baby in August. McMillian, who worked “from time to time” at his uncle’s grocery shop last summer, said even though the pay was pretty good — he got $8 an hour — he needed work that was more steady to meet the needs of an infant. Program participants are paid $7.50 an hour for 20 hours per week. “She’s gonna be in my pockets,” said McMillian. He is applying at Culver’s and hopes the experience from working over the summer will help him land the job. McMillian also said he would be interested in working toward a part-time position at Neu-Life. Rhodes stressed that even though Neu-Life participates in the summer work program, it also provides opportunities for youth year-round “to help them sustain some sort of independence during school time.” She said a third of the organization’s staff has been involved in the Earn & Learn program. The Clean Summer Youth Program received $375,000 of funding for 2015, missing out on $60,000 more from Community Development Block Grant funds, money that Stamper said would have allowed the program to employ 30 more youth. After the funds were allocated to the youth program during a May 27 Community and Economic Development Committee meeting, the money was returned to Compete Milwaukee, a transitional jobs program that has struggled to fill 135 openings because of narrow eligibility requirements. As of the committee meeting, 72 of those placements had been filled. Stamper, who initially asked for $1 million, said he just wants the money to be put to the best use, and that both programs should be reevaluated. At the same time, Stamper said kids want to work and “the capacity is there” to employ them. Jill Lintonen, a marketing and public relations specialist at MAWIB, said about 52 percent of youth who applied for the Earn & Learn program were placed in a position. The Earn & Learn program has served about 22,000 youth over its 10 years.